What is the CyberSecurity Journal? The Cybersecurity Journal is a publication for CEO, CISOs, CTOs, C-level executives and other IT decision makers that provides expert opinion, tips and cybersecurity best practices. 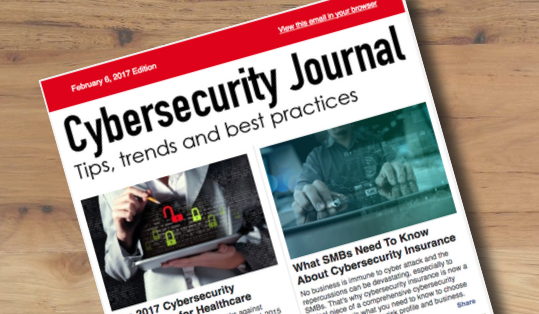 Cybersecurity Journal is distributed several times per month to over 7,000 executives and decision makers. Cybersecurity Journal is owned and operated by ContentMX. ContentMX is a content marketing agency that helps organizations increase sales through the development and deployment of engaging content. Be featured in our “Share Your Thoughts” authentic video interviews. Interviews are conducted in-person at trade shows or remotely through Skype. Establish a content marketing service plan with ContentMX. Choose the level of service that fits your budget. Interview with a CyberSecurity Journal editor to produce a content plan and a content calendar to address the top cyber security concerns and solutions relevant to your audience. CyberSecurity Journal produces custom written articles on cyber security for your review. Make adjustments and then post using our powerful content marketing platform. Use the platform to easily post these custom articles to your blog and your social media, and to assemble and distribute a great looking newsletter. Or, we can do it all for you. Once posted to your blog, your cybersecurity articles will be featured in the CyberSecurity Journal and sent to a mailing list of top IT executives and the C-suite. You’ll receive a report listing people who have clicked to read your article, including their contact information. Why Content Marketing with Cybersecurity Journal? Our goal is to provide a complete solution that leverages content in a way that most directly impacts your business. This is a multi-layered approach that is implemented in a simple way. We start by looking at the end point first. The Cybersecurity Journal reaches the C-level executives and IT decision makers that are great potential customers. An email is sent every two weeks with links directing readers to the content on your blog. We’ll even tell you who these people are – their name and contact information. Your blog will receive clicks from Cybersecurity Journal and it will gain organic traffic from search, lifting your overall search position. More traffic means more leads. Every month you get fresh new content, written in your voice, to post to your blog, share on your social media and distribute through an email newsletter to your audience. In this way, you are fully leveraging content to drive web traffic from multiple sources. To learn more about generating leads through Cybersecurity Journal and the ContentMX platform, contact us today!